On the heels of this morning’s news of Dieselgate going international, Volkswagen CEO Martin Winterkorn is out at Volkswagen and has been replaced by Matthias Müeller, the current CEO of Porsche, according to a report in German magazine Der Tagesspiegel that remains unconfirmed. Martin Winterkorn is to be replaced this Friday as Volkswagen boss. This was told the Tagesspiegel from supervisory circles. 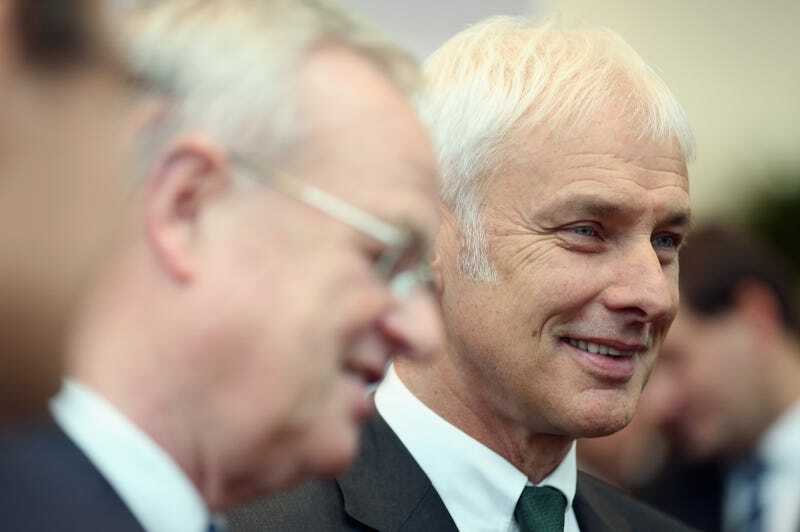 Winterkorn did after diesel exhaust fraud in the US is no longer the confidence of the supervisory body, it said on Tuesday.Successor to the 68-year-olds should be according to the circles Porsche CEO Matthias Müller (59). This Wednesday will meet the Presidium of the VW supervisory board, on Friday the 20-member panel. Winterkorn was due to have his current contract renewed on Friday, but VW didn’t wait for the old one to expire, according to reports. As we reported earlier, Volkswagen has admitted that 11 million cars globally could have the “defeat device” that started an EPA investigation here in the United States and that the company has set aside $7.2 billion to deal with the issue. We are awaiting confirmation from Volkswagen. Contact the author at matt@jalopnik.com. Photo: Getty Images.